February has come and gone and the Patreon wallpaper is a little late. 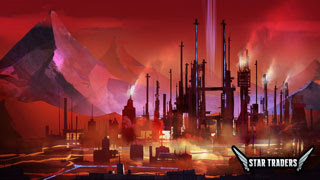 Here the epic rendering of an urban zone on a molten world! Hope you enjoy the wallpaper, 3 sizes -- 800x1200 (mobile), 1920x1080, and 1920x1200. Join us on Patreon for as little as $1/month to get an awesome, monthly digital wallpaper download, voting rights, access to the exclusive art stream and big discounts on our alphas.